Heat oven to 450°F. Mix flour, sugar, baking powder and salt in medium bowl. Cut in shortening, using pastry blender or crisscrossing 2 knives, until mixture looks like fine crumbs. Stir in 1 1/2 cups milk just until blended. Place dough on lightly floured surface. Gently smooth into a ball. Knead 20 to 25 times. Roll dough 1/2 inch thick. Cut into 10 stars with floured 3-inch star-shaped cutter. Place about 1 inch apart on ungreased cookie sheet. Bake 10 to 12 minutes or until golden brown. Make pudding mix as directed on package for pudding, using 4 cups milk. Split warm shortcakes. Fill and top shortcakes with pudding, raspberries and blueberries. 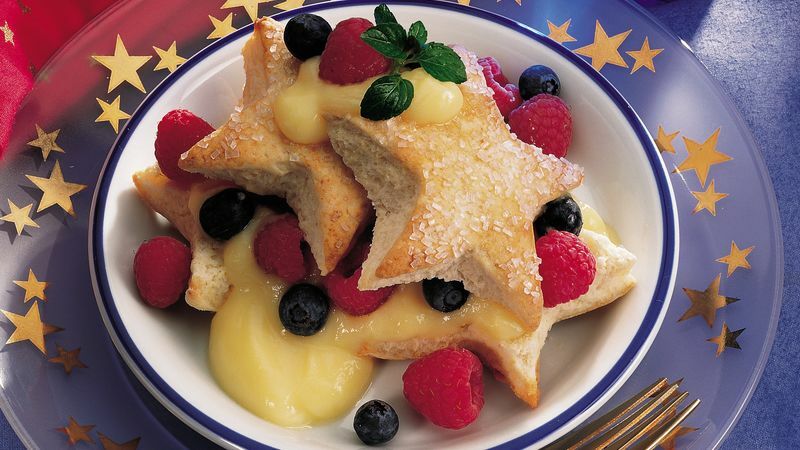 Sweeten your stars by sprinkling them with a bit of coarse white decorating sugar or granulated sugar before baking. You can also make the shortcake dough in a food processor. Follow step 1 directions using a food processor fitted with a plastic blade and pulse just until ingredients are thoroughly combined. Place dough on a lightly floured surface and roll out as directed.